"Be prepared." These words of wisdom have been echoed by scout leaders, guides, and seasoned outdoor lovers for generations. It's true. Weather can change quickly and the unexpected can happen. To manage the risk, add these essentials to your backpack before your next daytrip on the trail. Don't go hungry or skimp on calories. 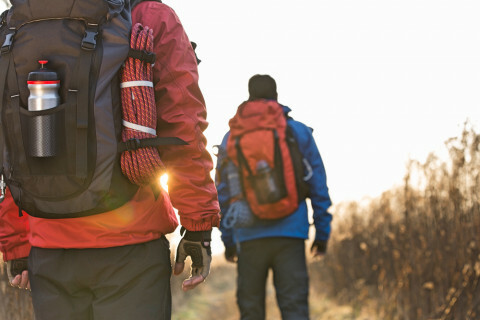 An average hiker should consume about 200 calories every hour and depending on your exertion level and body type between 2,500 and 4,000 calories a day. A mix of carbs, proteins, and electrolytes are key. Pack food you like. Nuts, granola, energy bars, candy, dried fruit, jerky, or even a healthy sandwich are good starting points. Add electrolytes to your water if exercising for more than a couple hours. Fact: You can't live without water. 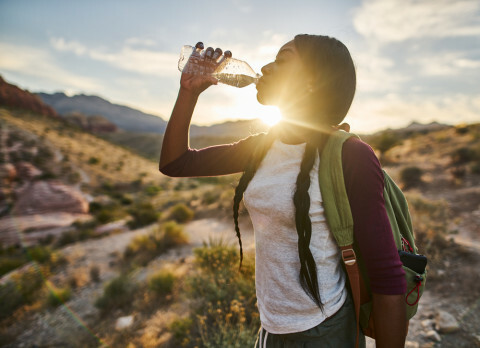 Actual amounts of water a hiker should drink vary depending on temperature, body weight, age, etc. However, we recommend 4-6 liters or water per day or more if you're hiking in extreme heat. Drink before you are thirsty. And, keep water within easy reach... in a side pocket of your backpack or in a hydration system. It's no fun to walk--er, stumble--in the dark. Pack a lightweight torch or headlamp with LED bulbs. Not only are they brighter, the batteries last longer too. We recommend adding fresh batteries to your light before leaving home. Trust us: It's darn near impossible to start a fire by rubbing two sticks together. Save yourself from extra trouble and pack waterproof matches and a magnesium fire starter in case you need to build an emergency fire. Map, compass, and app. Call us bias but we cannot stress enough how important it is to know your location when exploring the outdoors. Make sure you download all the routes and offline maps you need on your smartphone, tablet or smartwatch. Pack a compass and waterproof trail map too, if exploring new territory or places with tricky navigation. The sun is more intense at higher altitudes and near water, so protect yourself with proper sunglasses, sunscreen, and sun hat. Experts recommend sunscreens and face balms rated at 30 SPF or higher. Your nose, ears, and neck will thank you. 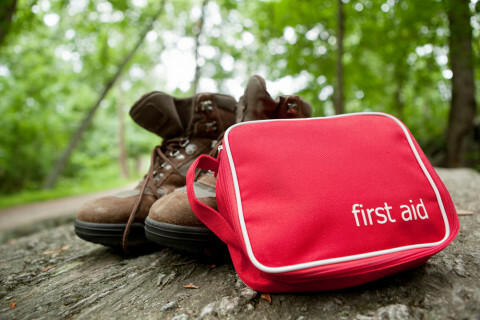 Injuries may happen when you least expect it, so carry a compact first-aid kit. Add a small whistle, extra medications, water purification tablets, and, if needed, backup glasses/contacts. If you are allergic to bee stings or insect bites, pack anti-bite gel or, for more serious reactions, don't forget your epipen. There are countless uses for a knife in the outdoors. Survival and army purists may debate what type of knife is best: fixed blade versus folding knife versus multi-tool. You decide. Bottomline: Don't be caught in the wild without this essential tool. Weather can change quick in the woods, desert, and mountains. Pack layers so you can add or remove clothing as the weather changes from cold to hot, windy to rainy and everything in between. Check the forecast so you know what to expect. Tip: Summer in the mountains can still bring chilly tempertures and wind. Bring a winter cap and lightweight gloves. 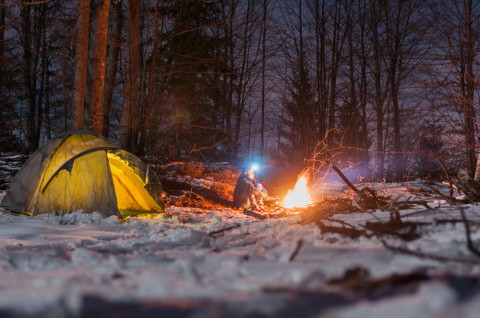 If your daytrip is super ambitious, demands long hours or distances, or wanders into extreme conditions, consider carrying a lightweight bivvy sack or space blanket in case you need to bunker down for the night. A little shelter can help a lot and surely beats snuggling with a tree or bear. Staying overnight? Pack the right shelter for the conditions. Have we missed something? Tell us about your "must-pack" essential in the comments below.